MISSISSAUGA, ON, Oct. 26, 2017 /CNW/ – Morguard North American Residential Real Estate Investment Trust (the “REIT”) (TSX: MRG.UN) announced today the completion of a joint venture with Healthcare of Ontario Pension Plan (“HOOPP”) of Coast at Lakeshore East (“Coast”), a 515-suite urban rental high-rise in Chicago’s desirable Loop district. The REIT completed the acquisition of Coast in July 2017 for a purchase price of $287.5 million (US$222.5 million). Under the terms of the agreement, the REIT and HOOPP will own the property on a 51/49 basis, respectively. Morguard Management Company, a subsidiary of Morguard Corporation, will act as property and leasing manager as well as provide advisory services. Coast is the REIT’s second joint venture acquisition with HOOPP in the U.S. The entities previously partnered on a mid-rise rental apartment community in Florida. Coast is a 46-storey Class A property prominently located in the Lakeshore East master planned community, part of Chicago’s famed Loop district. Developed in 2013, Coast offers unencumbered views of the Chicago River, Navy Pier and Lake Michigan and best-in-class fundamentals including nine-foot ceilings, above-average unit sizes and floor-to-ceiling windows. The property features 18,000 square feet of ground floor retail and a focus on green living: the LEED Silver building offers a smoke-free environment, world-class fitness centre, heated outdoor pool and access to the Chicago Pedway. Coast is Morguard’s third strategic investment in and around Chicago’s vibrant Loop neighbourhood. 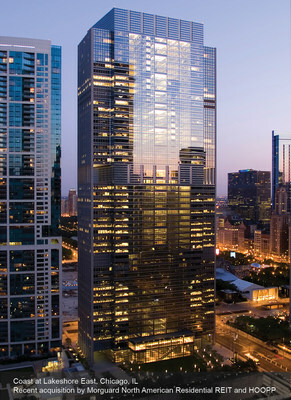 Morguard Corporation (TSX: MRC), the REIT’s sponsor, has ownership in two other premium high-rise apartment properties in downtown Chicago: Alta at K Station and Marquee at Block 37. Visit the Coast at Lakeshore website: www.rentcoast.com. The REIT is an unincorporated, open-ended real estate investment trust established under and governed by the laws of the Province of Ontario. The Units of the REIT trade on the Toronto Stock Exchange under the ticker symbol MRG.UN. With a strategic focus on the acquisition of high-quality multi-suite residential properties in Canada and the United States, the REIT maximizes long-term Unit value through active asset and property management. Its portfolio consists of 13,314 residential suites (as of October 31, 2017) located in Alberta, Ontario, Colorado, Texas, Louisiana, Illinois, Georgia, Florida, North Carolina, Virginia and Maryland with an appraised value of approximately $2.6 billion at September 30, 2017.